The CEMS student body is organised on a local level within CEMS Clubs and on a central level in the Student Board. CEMS Clubs is a student organization, group of motivated and qualified students who “take care” of other CEMSies. CEMS Club prepare various social, teambuilding as well as educational and PR events and activities, also in cooperation with CEMS corporate partners. You can find all the information, including news and calendar, on CEMS Club website. Feel also free to join the Facebook page. Each semester students publish CEMS Insider Magazine. Every spring, there is an event organised specially for new CEMSies – the Rookie Weekend. Taking place somewhere outside of Prague, the Rookies have a great chance to get to know each other and have fun during many diverse activities. Probably the most popular event of the year takes place once at the beginning of every term. CEMS students and alumnis spend a wonderful weekend outside of Prague full of games, parties, trips and other exciting activities. Each spring, CEMS Club also organizes an exclusive event – a Gala Night. A night full of music, dancing and conversation for students, teachers and corporate partners belongs to the highlights of the year. An official dinner takes place in a classy restaurant, where two to three corporate partners are present. The idea behind the “rotation” is that after each course the students change the table (rotate), but the company representatives stay at the same table (table of company X, of company Y, etc.). The point is that every student eats one course with one company. During a course the students have an opportunity to informally talk to the employees from each corporate partner and get an impression of what the company stands for as well as of the career possibilities and the recruitment process. Twice a month, all students, old and new, have a great opportunity to meet, chat and drink in one of Prague’s beautiful bars, restaurants or clubs. Usually before the CEMS drink some sport or cultural activity takes place. Party is being organized in the beginning/end of each term. 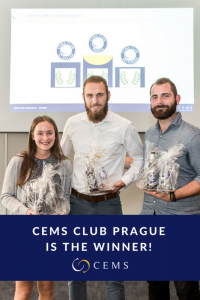 CEMS Club Prague was awarded as the best CEMS Club in 2009, 2011, 2013 and 2017.